Italian giants looking at three Chelsea players. 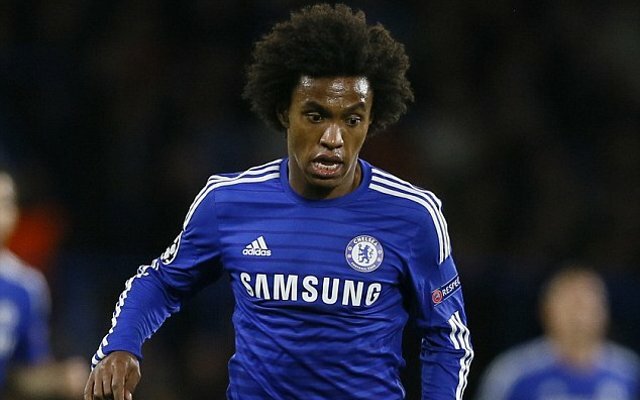 Juventus are reportedly eyeing up moves for one or more of three Chelsea players this summer, with Brazilian winger Willian the latest to come onto their radar, according to the Daily Mirror. The Italian giants are seemingly on the lookout for new midfielders this summer, with the Mirror adding that Chelsea are also among the clubs wanting to raid the Serie A champions for their star midfielder this summer – Paul Pogba. If the French international were to leave Turin, it would clearly leave a big hole in Massimiliano Allegri’s side, which makes his interest in landing one of these three Chelsea stars unsurprising, especially given the Blues’ amazing depth in that department. Jose Mourinho has often struggled to give opportunities to all his midfielders, which saw Andre Schurrle leave Stamford Bridge for Wolfsburg in January, following on from exits for Juan Mata and Kevin De Bruyne last season. A hard-working player, but far from the most spectacular, Willian only managed four goals in all competitions last season and is not necessarily guaranteed a starting spot at Chelsea next season. According to the Mirror, he is the latest player on the books at Stamford Bridge to emerge as a target for Juventus in midfield. With Juan Cuadrado knocking on the door out wide, it might not be the worst decision for the club to cash in on the 26-year-old.